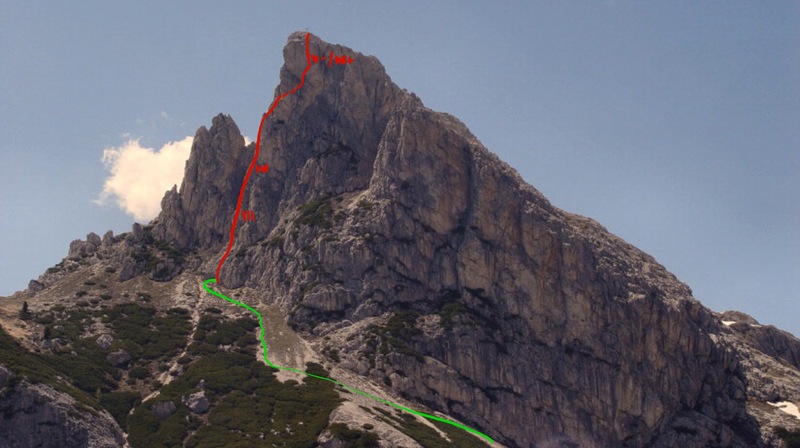 The Spigolo Sud or South Arete of the Sass di Stria is a magnificent and highly attainable goal for the aspirant rock alpinist. 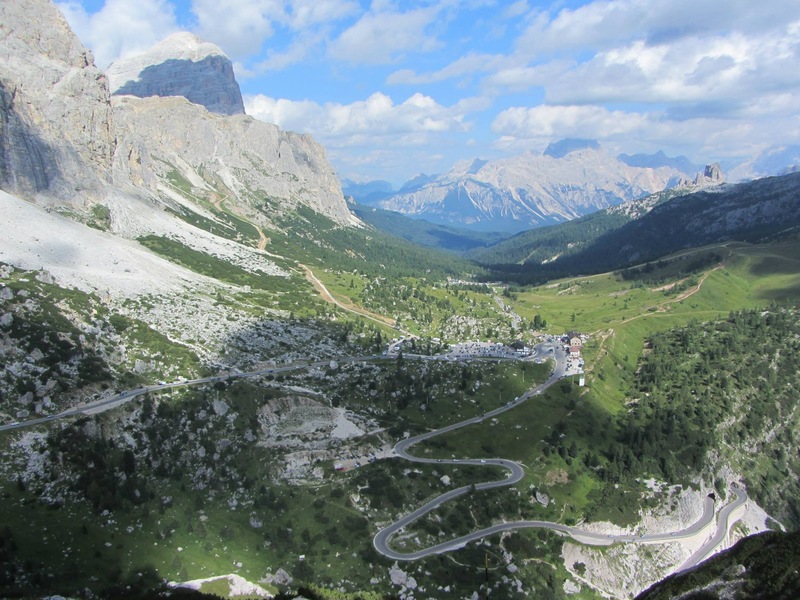 Over looking the famous Passo Falzarego it affords not only excellent climbing, but stunning views and an extensive insight into the history of the area during the descent. 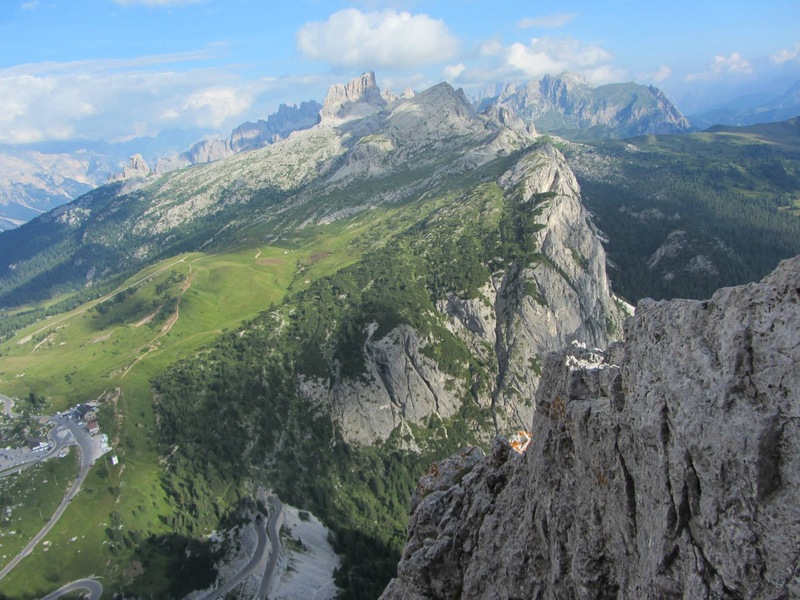 With a minimal approach it is great as an introductory climb if you’ve not experienced Dolomite rock yet. 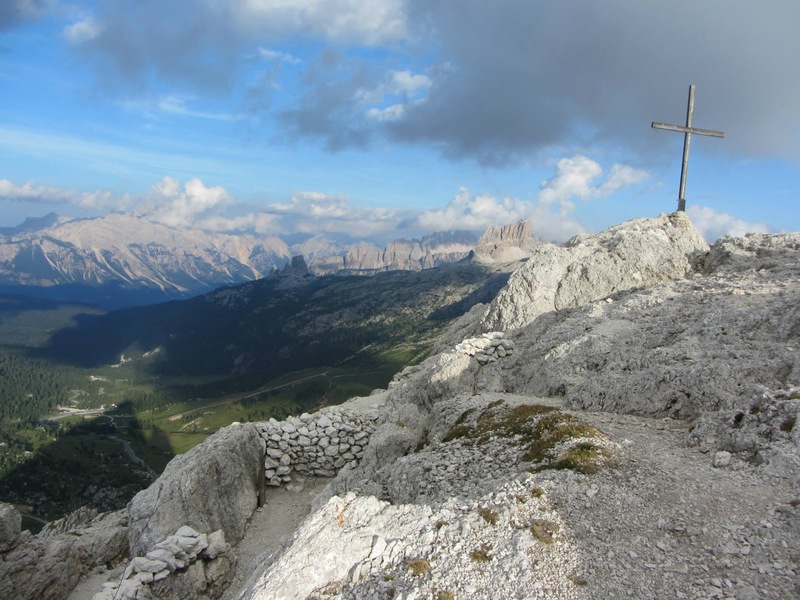 Looking out over Passo Falzarego towards Tofana di Rozes, Cinque Torri, and Averau. Only 25 minutes drive from Casa Alfredino, park either at the Lagozuoi cable car station or at the Fort museum at Passo Val Parola. From the cable car station follow the road towards the pass and vice versa from the pass. 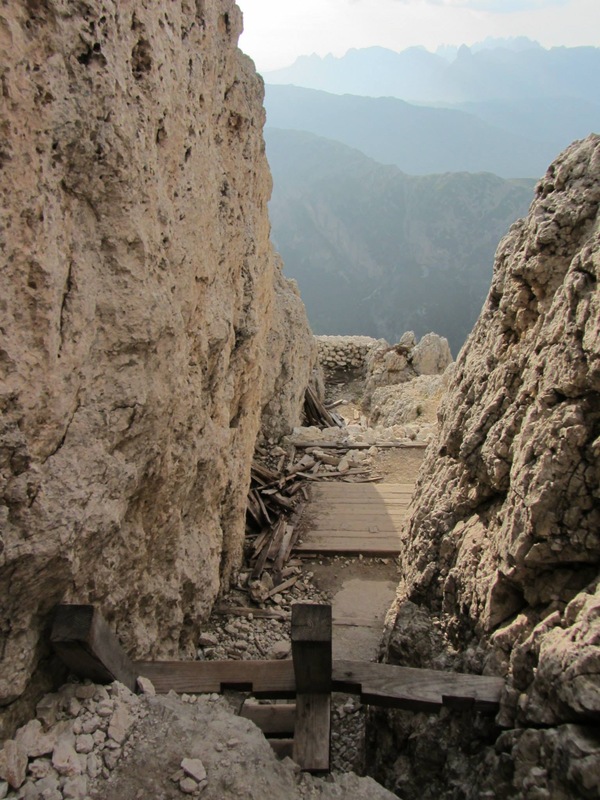 About midway between the two there is a small rock gym area just south of the road on the very foot of Sass di Stria. Walk over to this from where you will see an obvious path leading around the eastern flank of the mountain. This ascends quite steeply through scree and scrub until the South Arete is reached in around 15 minutes. If you go a little further you will reach old trenches which are interesting to look around. As with most trade routes in this area there is extensive fixed gear on the route. So 10 extenders (slingdraws are useful), a few 120cm slings, a set of nuts and sizes 0.5-1 Camalots will suffice. Of course it’s assumed you will carry a small pack with a rain proof and something warm in case of a summer storm! 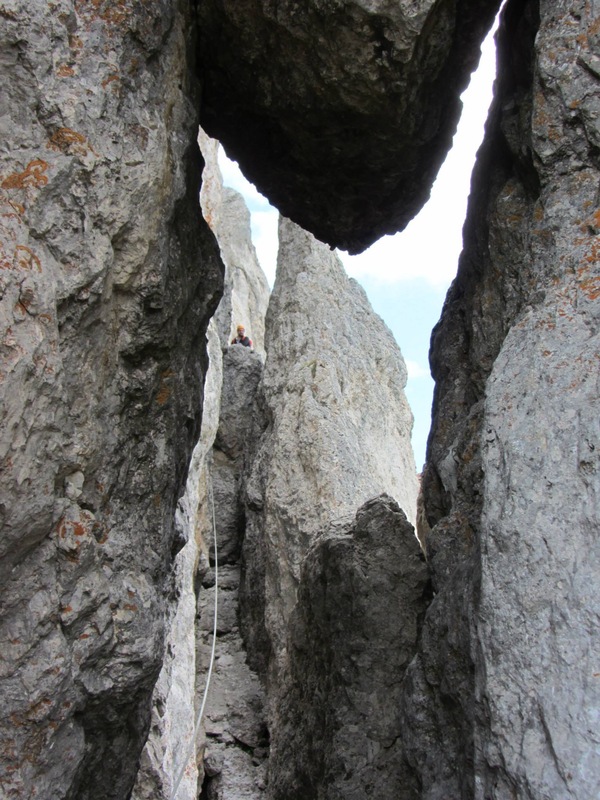 Shortly before reaching the Arête, at one of the numerous beefy ring bolts enroute. Six pitches at a fairly sustained grad of UIAA IV or around Hard Severe / 5.6. The initial pitches start easily climbing out of a gully onto a rib. Belays are denoted by large steel ring bolts which are usually painted with a red blob and are frequent – you can easily run some of them together. On the arête looking out over the mountains. The route follows this rib for a couple of pitches and it slowly becomes more and more acute to form a sharp arete. At one point an improbable and exposed section leads up the left side of the arete just when you think it should go right; the difficulties are short lived but exciting. This leads to a chimney and large ledge where upon if you look right you will see an enormous leaning flake with a passageway behind it. The hidden passageway. Continuing direct at this point is apparently about UIAA VII! Climb up to this and through the hole to the other side. Here you find either an easy exit at grade III or a more testing direct line up a groove at V- which is well worth the effort if you have the ability. This deposits you directly at the summit cross where you can sign the summit log. The summit – it’s a great place with room for a nice lunch and tremendous 360 views. Trenches from the war extend virtually to the road from the summit. From the cross go down westwards where you will find the first one. If you have time, take a head torch with you so that you can explore the war tunnels. If pressed for time it takes maybe 45 minutes to reach the car park from the summit. The route is reasonably obvious bar little side trenches, but if you get lost, climb up out of the trench to help you reorient. Some of the trenches with their wooden ladders. 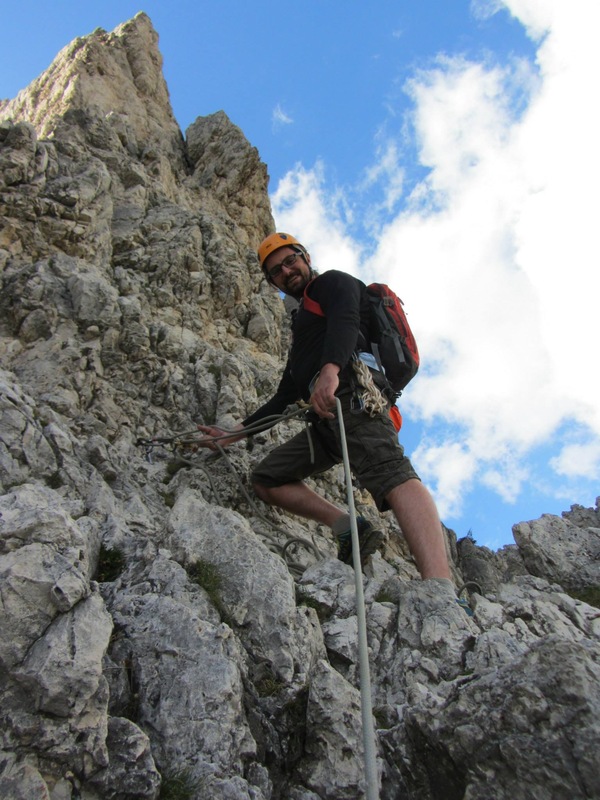 Although classed a Via Ferrata, there is very little one could call climbing, bar a few ladders.